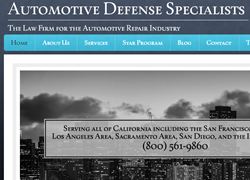 Automotive Defense Specialists is a top California law firm specializing in Bureau of Automotive Repair defense cases. Growing concern over criminal law has sparked the firm to initiate a Q&A series on its blog. There is growing concern and confusion over possible criminal actions filed the California's Bureau of Automotive Repair. Automotive Defense Specialists, a California law firm of attorneys with expertise in Bureau of Automotive Repair criminal cases at http://automotivedefense.com/, is proud to announce the launch of a five-part Q&A series on its blog concerning issues surrounding the Bureau of Automotive Repair actions against SMOG check and STAR program participating stations in California. To read the first blog post in the series, please visit http://automotivedefense.com/?p=1507. The first post discusses how potential criminal actions against a SMOG check or STAR program station often begin. It also discusses how bail is typically set, and whether a station owner may be personally held responsible. Interested parties are urged to not only read the post but also consult an attorney specializing in Bureau of Automotive Repair defense issues. With the Bureau of Automotive Repair stepping up enforcement of California's complex regulations regarding SMOG check stations, including those participating in the so-called STAR program, there is increasing interest in both administrative and criminal potential actions. Other posts in the series describe the types of offenses that might lead to criminal actions, the use of undercover cars by the Bureau, and terms used in these cases such as 'forged instrument.' Interested parties are urged to bookmark or subscribe to the blog. Those facing an immediate action are urged to consult advice from an attorney specializing in Bureau of Automotive Repair cases.